8mm Forum: GS1200 Capacitor - A winner ! » 8mm Forum » 8mm Forum » GS1200 Capacitor - A winner ! Author Topic: GS1200 Capacitor - A winner ! Mr. Elmo has supplied us with the ingredients for a 100 % improvement in magnetic sound recording quality on the GS 1200. The Capacitor works, works, works. For those of you who remix the audio on S8 prints, replacing the Capacitor that has been discussed here on the forum gives the sound quality a dramatic improvement on the Main and Balance track. Not a difficult change out and worth the time to do it. The capacitors are available in the United States from many electronic stores and online companies. Thanks Kevin for the research and information on making the hobby another cut above the norm. Could you post a photo of where this capacitor is located in the GS1200, and also the specs for the replacement cap? That would be indeed very interesting to see! Kev, why not go one better and finish your website! Could prove very popular. These are "original Kevin Faulkner photos"
To arrive to the capacitor you have to disassemble the lid where the vu meters are. Thanks, Ugo. Please note that the capacitor soldered in place on the board was there to test the theory out in the first place so should be ignored. The capaictor must be 3300pf and rated at 600V DC. If a capacitor of lower voltage is used it will fail due to overheating. The cap has to put up with a very peaky wave form. Its better if possible to use a 1 or 5% tolerance capacitor and it should be of the polystyrene (pref) or polyester type. This is the board that lies behind the meters. There are 2 screws in the back of the machine which hold the cover in place and another along the front edge behind the drop down side cover which will also have to be removed. The cap can be changed without the need for circuit board removal. Kev, regarding your website, lets go for it. Geraldine would love a website for her business and we can both learn from our mistakes. I have a couple of programs capable of pulling this off so the HTML code should not be a problem along with the graphical layout. When it comes to Domain names, web hosting and all the other malarkey, then it’s down to you buddy. Great excuse to get together and run a few reels for inspiration and research. Changing this capacitor will change your life. You will want to re record everything you have. Right! the GS has a quality recording better than every other machine! I have an ELMO ST-800 which is a pretty poor performer recording wise (massive fluctuations in recording level, with bursts of "too loud" mixed in with "not loud enough"). I am wondering if this capacitor is common to the ST-800's recording circuitry and if a swap out will help. What is the sound improvement this change usually brings? I was just going to ask the same thing! What, exactly, does this capacitor swap improve (and how much)? This capacitor is the main cap which controls the frequency that the recording oscillator runs at. This is about 60Khz I think in the GS machines. As this drifts higher in value the frequency then drifts and will eventually go out of range to the point that the oscillator will stop running and you will no longer be able to record anything. Before it gets to this point you notice that the playback levels from your own recordings get lower and lower and a lack of Bass response is noticeable. Eventually you even start to get a sort of whistleing noise through the speakers when recording because the cicuits to filter the oscillator frequency out no longer do so because the frequency has driftef so much. Hope that all makes sense. It certainly would if you put an oscilloscope on the heads and watched what was happening. All the Elmo's use the same type of circuit for the record oscillator going right back to the early ST1200's so yes there could be problems with other machines such as the ST800. I dont have a circuit diagram for that model so cant tell you what exactly the capacitor is etc. It will be fairly similar though to the GS but really the problem with the GS is that Elmo have a high wattage resistor under the capacitor. This resistor get quite hot when in the record mode as it's there to lower the voltage to the red led that indicates you are recording on that track. This slowly cooks the capacitor with the result that it eventually gives up the ghost. The problem you have with bad variable recordings could be down to head wear or maybe you have the ALC circuit switched in? I think the ST800 has that swichable? The cap in question wouldnt give variable results but consistantley bad results. 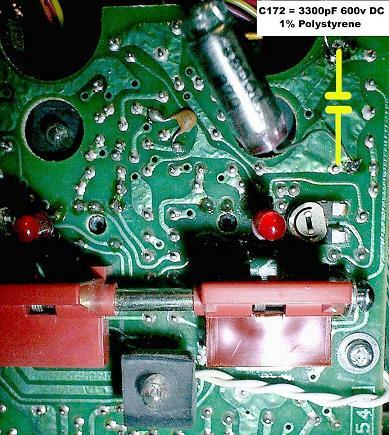 So in short, the capacitor swap restores the correct bias current that's mixed with the sound signal to be recorded before they're sent to the magnetic heads (all tape recorders use this principle, adding an extremely high-frequency current to the sound signal for proper EQ as well as recording of very low frequencies = bass). Am I right? Jan, That sums it all up very well. Spot on. Would you believe I REPLACED the capcitor all by my lil' self! THANKS KEV!!!!!!!! Good Rob, I'm glad it worked out OK. See I told you it wasnt too difficult to do. In every case so far this cap change has worked and cured many recording problems. Any link of a web shop in Europe offering these capacitors? I have an issue Recording through Aux in on My GS-1200. Upon playback, left channel ( main stripe ) audio level quite low with volume set to halfway point and meter barely moving. Right channel very good volume only at 1/3 point. It has better bass and treble too! meter moving to peak at zero. 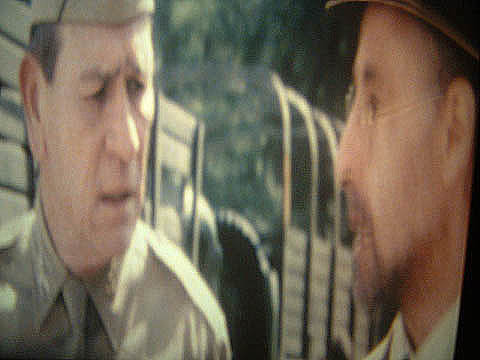 I have tried on other test reels to eliminate stripe being the cause so it is a recording issue. My question is other that the recording capacitor, is there another component that may be the cause of the poor Recorded Audio on the main track? I would add that pre-recorded prints PLAY just fine on my unit.